NEW YORK (CNNMoney) -- Verizon has decided to block its customers from installing Google's new, high-profile Wallet application on the carrier's smartphones. Welcome to the opening shot in the war over who will get a piece of the action as your smartphone becomes your mobile wallet. A year ago, Verizon, AT&T (T, Fortune 500) and T-Mobile teamed up with Discover (DFS, Fortune 500) and Barclays (BCS) to form a mobile payments company called Isis. Using a technology called near-field communications, or NFC, the forthcoming Isis mobile wallet will let consumers store multiple credit cards and make payments with a wave of their phone. They'll also be able to check balances, receive coupons and use rewards points at the point of sale. Google Wallet is a nearly identical NFC service. Unveiled by Google in May, the service requires two pieces: An NFC chip and Google's app. The first phone to feature native Google Wallet support is Samsung's Nexus S, which went on sale last year with a built-in NFC chip. 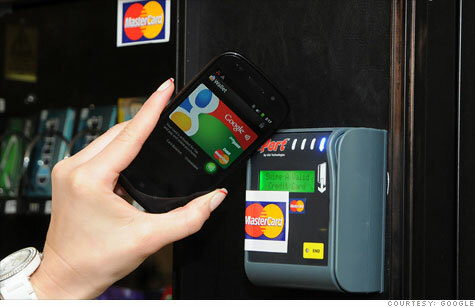 In September, Google Wallet went live and the Samsung Nexus S became Google's mobile payments guinea pig. Here's the catch: Sprint (S, Fortune 500), along with MasterCard (MA, Fortune 500) and Citigroup (C, Fortune 500), threw its support behind Google Wallet and partnered with Google. Verizon and the other major carriers are backing Team Isis. The two technologies can co-exist happily. MasterCard, for example, has partnered with both Isis and Google Wallet. Phones can easily support both options, letting customers download either or both payment apps and choosing which they prefer to use. But with billions at stake in the mobile payments revenue stream, every player in the ecosystem is moving very, very cautiously. "This is an opening salvo in what is likely to be a very long war for the mobile consumer wallet," said Carl Howe, analyst at Yankee Group. "I think this is perhaps a very good indication that Google is now a very close frenemy of Verizon." The Samsung Galaxy Nexus, set to go on sale later this month, was supposed to be the first Android device on the Verizon network to feature Google Wallet. It's the third of Google's "hero" Android smartphones, which are designed by Google explicitly to show off the cutting-edge features of its Android operating system. Google partners with manufacturers on the phones -- Samsung, in this case -- and releases them under the "Nexus" brand. But a Google (GOOG, Fortune 500) spokesman said Tuesday that Verizon Wireless has asked the search company "not to include this functionality in the product." Google's spokesman declined to discuss Verizon's reasoning or comment further. Verizon (VZ, Fortune 500)'s spokesman Jeffrey Nelson countered that the company "does not block apps." The problem, Verizon says, lies in Google Wallet's technology. "Google Wallet is different from other widely-available mobile-commerce services," Nelson said in a prepared statement. "In order to work as architected by Google, Google Wallet needs to be integrated into a new, secure and proprietary hardware element in our phones." It's true that Google Wallet needs to access a special NFC chip built into the device. Verizon didn't explain why that was a problem, particularly because Google's technology has been working just fine on Sprint's network for several months. But Verizon said it is continuing "commercial discussions" with Google about the issue. "We're working to provide expanded services that will provide the best security and user experience in the market around mobile commerce," Nelson continued. "We expect to provide access to an open wallet when those goals are achieved." It's not a direct answer, but it's possible to read between the lines. Since Verizon said it is working to provide access to "an" open wallet, and not specifically Google's Wallet app, it's likely that Verizon is hoping to favor its own mobile payments option over Google's. Both Isis and Wallet are theoretically "open" services, meaning any card company, carrier, manufacturer, or even mobile operating system can participate. But so far, each has mostly gone its separate ways. Verizon's blocking of Google especially ironic, because Google and Verizon fought together to lobby the Federal Communications Commission to allow carriers to determine what services can be used on smartphones running on their networks. That agreement is coming back to haunt Google. Last year, as the industry thrashed out so-called "net neutrality" rule, Google and Verizon stuck a controversial compromise: They jointly agreed that open Internet proposals should not apply to the mobile market. Their position was that the wireless field is more competitive and changing more rapidly than the wireline broadband market, and shouldn't be constrained by added regulation. The FCC ended up drafting rules that closely mirrored those suggested by Google and Verizon. Those rules went into effect Nov. 20. Can Verizon permanently keep Google's Wallet off its smartphones? Probably not. When the public pressure -- and pointed queries from Washington watchdogs -- grows intense enough, tech industry rivals tend to make their peace. Apple (AAPL, Fortune 500), for example, finally got over its claimed technical objections and let rival services like Google Voice onto its iPhone. But Verizon can drag its feet -- and its latest chess move indicates that it's not giving Google a mobile payments head-start without a fight.